The quay at Santa Margherita Ligure is a beautiful place, and on this particular morning it seemed just a little more beautiful than usual. In addition to the warmth of the Italian sunlight on my back, the verdancy of the hills all around me, and the freshness of the morning air coming in off the Golfo di Genova, there was a profusion of motoryachts on hand, each lined up with her stern towards the stone walkway I was happily strolling along. What a sight: so many new vessels, each brought here by her builder so that a bunch of magazine types like me—folks from all over the world, really—could do test drives and take pictures. 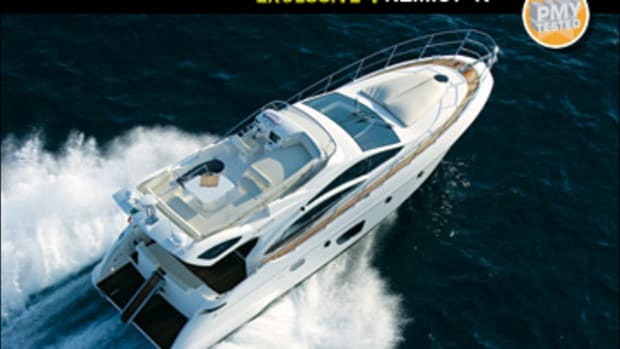 The Italian Trade Commission was promoting the event, along with UCINA (Italy’s equivalent of America’s National Marine Manufacturers Association) and the builders themselves. Something cool happened when I took a long look ahead. 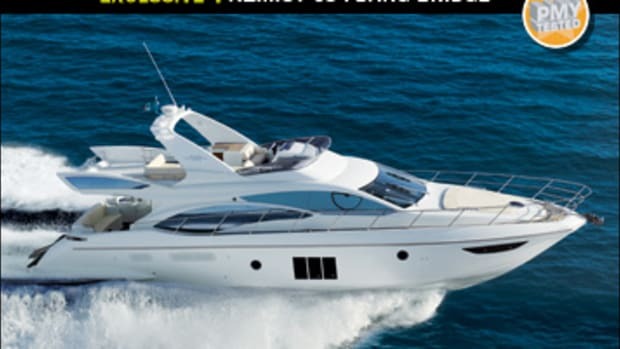 Because a few late arrivals had left some intervening slips empty, I was treated to a full, panoramic view of a vessel that stopped me dead in my tracks: the Azimut 62. To say she was stylish in the extreme would be an understatement. She was the most eye-catching vessel I’d seen in months. 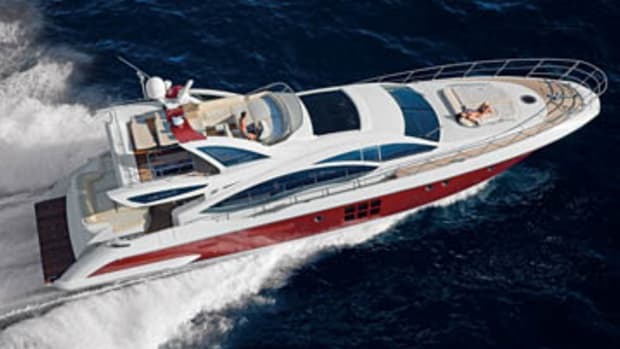 I surveyed her sleek profile, the unmistakable work of famed Italian designer Stefano Righini: wild, shark-fin-shape windows in the superstructure, Bannenberg-style windows in the hull sides, and an array of vestigial fins, some trailing off the radar arch, some off the boat deck, and a couple of whoppers off the stern. 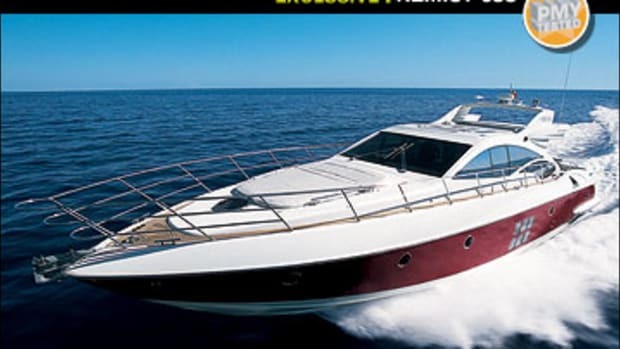 “Whoa!” I chortled, getting a move on—this European version of the 62 was my test boat for the day. I went onboard via an optional Opacmare passerelle—a solid, finely crafted piece of work—and, after strolling forward through the saloon, introduced myself to the 62’s captain, who was seated at the lower helm station. 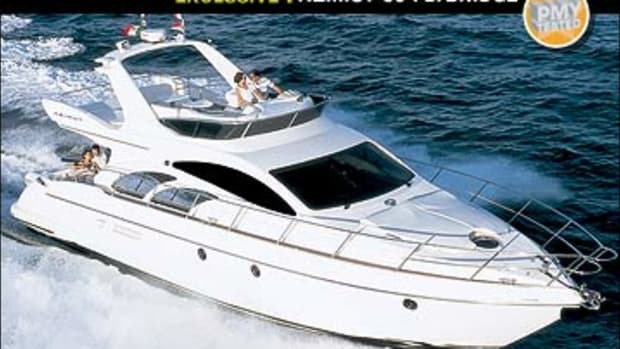 With characteristic Italian flair, he fired up the mains immediately—two 900-hp MTU 8V2000s—and, after taking an appraising look over his shoulder at the bunch of journalists he had standing pensively around, most of whom were going along for the ride, he began easing slowly out of the harbor toward the slick-calm Mediterranean. The helm was set up pleasingly enough. Straight ahead were VDO gauges in a nicely upholstered, rounded instrument pod. To my right: MicroCommander electronic engine controls by Mathers. To my left: a string of toggles and a Shipmate RS 8300 VHF, flanked by a broad chart flat. The polyurethane varnish that Azimut used to adorn the cherry veneers and burl panels in this area was special stuff, formulated to resist glare both at night when the overhead halogen spots were on and during the day when driving into the sun. It seemed to work well. I noted a couple of glitches, though. Visibility straight ahead was good, but it was poor on either side, primarily because of the thick mullions on the outboard edges of the windshield. And once I got the 62 up and running, with her bow pointed south towards distant Corsica, I began hearing the creak of cabinetry from the galley behind me. The source of the noise was tough to precisely locate, although it was more or less continuous. I called Azimut about the problem after the test. Our test boat had been a much-in-demand prototype, a company rep explained, and there hadn’t been enough time prior to the press event to fully bond the galley cabinetry into the interior FRP structure with fiberglass. He assured me the situation was anomalous—a proper job would be done later. Having finished with the lower helm station, I went topside to check out the upper one. 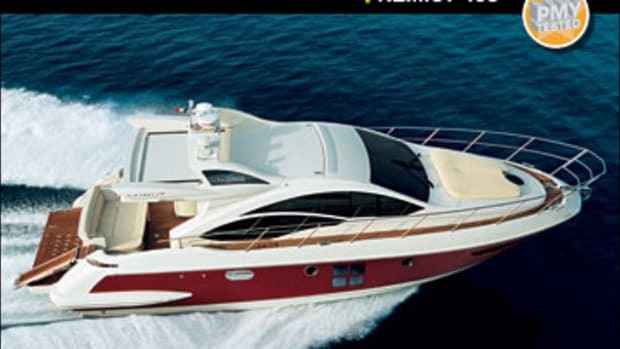 What I found was not wholly impressive, however, again because our prototype had been rushed to the press event, I was subsequently told by Azimut. The bench-style helm seat to port was too close to the steering console for comfort—and it was not adjustable. 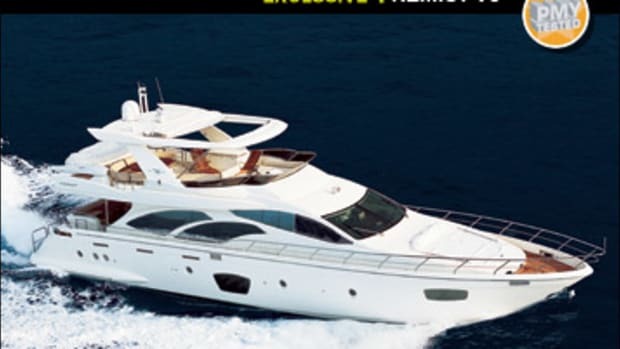 On the plus side of the equation, Azimut’s since moved the seat astern and added a sliding adjustment, according to the company rep I talked to after the test. Moreover, the radar arch overhead was a lofty one—the promulgation of lofty arches, and the resultant protection of folks on flying bridges from the harmful effects of radar waves, is one of my little crusades—and the average top speed I recorded while driving was a respectable 37.4 mph. As a result, we had a fine, fast ride returning to Santa Margherita, where I promptly launched into a dockside tour. The interior of the 62 seemed more American than Italian to me, at least in terms of the openness of the layout. 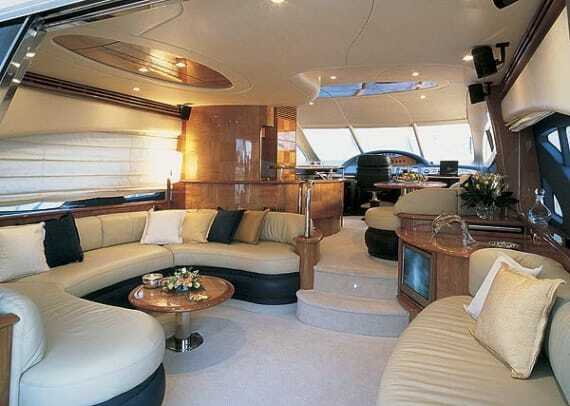 On the main deck, the lower helm station, galley, dinette, and saloon were all combined into one big living area, with excellent sit-down visibility virtually everywhere thanks to the size and positioning of Righini’s shark-fin windows. But Carlo Galeazzi’s interior decor was Italian all the way, thanks to the artistically finished American cherry furniture and cabinetry, finely crafted Ultraleather upholstery, polished stainless steel accents, and burlwood shelves and countertops. I was especially impressed with the layout of the 62’s lower deck. First of all, by creating a landing at the bottom of the stairwell that serves it, Azimut’s created an integrated, almost residential arrangement below. Our test boat’s three staterooms were focused around the landing, not lined up nose to tail like cows traipsing into a barn. 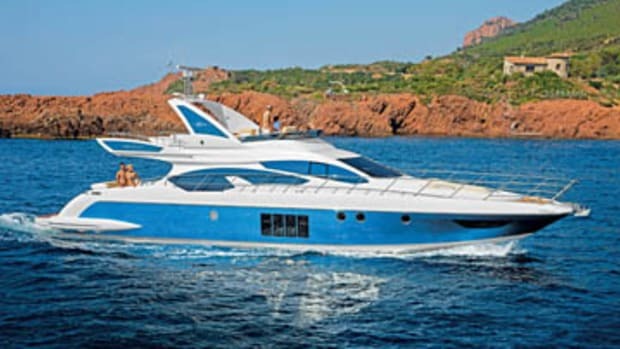 The VIP lay forward, with its own head—a sizable compartment that, like all others except the optional crew’s quarters astern, featured beveled mirrors and countertops of what Azimut calls “enameled crystal,” a snazzy blue, resinous-looking substance. Very Euro! The guest stateroom to starboard, which offers twin berths and a fair-size hanging locker, was just across the landing from a conveniently located day head. And the full-beam master aft, with its big, diagonal berth, was savvily separated from the forward engine room bulkhead by a large en suite head with separate shower stall and walk-in closet. The ploy works. When I closed the doors I could just hear the genset whispering away in the engine room. Which brings me to the last aspect of the 62 that I want to cover here: the machinery spaces. Upon entering them via a cockpit hatch and ladder, I found most of the auxiliary equipment positioned in a well-organized way, although mounting the air-conditioning pump in the aft bilge sump looked like trouble to me—if sloshing bilge water doesn’t get it, dampness surely will. Access to the mains was good, however, and I liked the Polistone Marine Tec flooring underfoot, a plastic material that looks nice and seems to offer good traction. 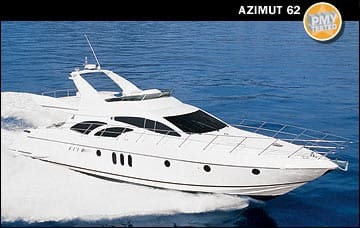 And finally, I liked the baffled, eductor-equipped fiberglass air-intake ducts Azimut installed—these are much safer and more seaworthy than the simple screened openings I used to come across on Azimuts years ago. I departed the boat at the end of the day the same way I’d arrived, via the walkway on the quay. At the spot I’d been transfixed earlier, I turned around for a moment. The sight was just as stunning as before. 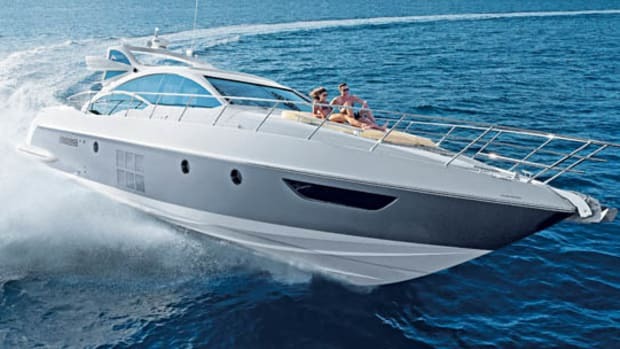 Certainly, I’d come across a few shortcomings while testing the Azimut 62, but on the other hand, she was a trendsetting super-styler of the first order. A true fashionista, no doubt about it.